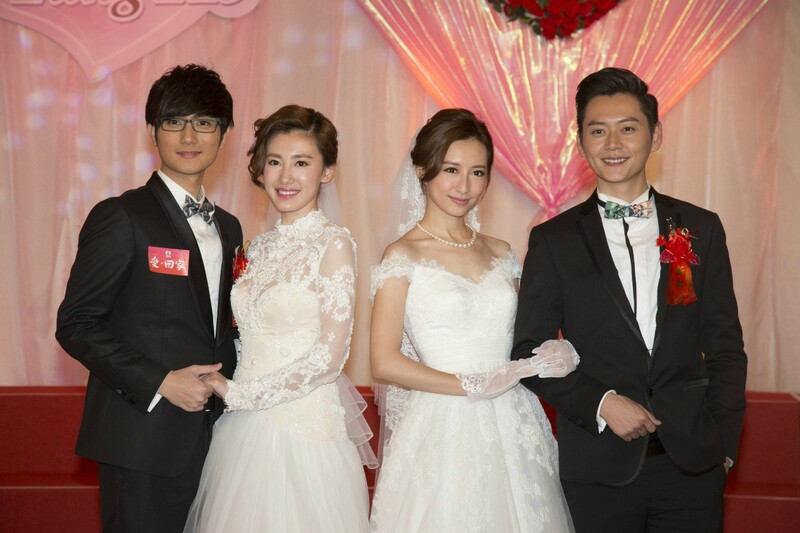 The first and second generation cast members of TVB’s sitcom Come Home Love <愛·回家> have shot the series’ final scene. The sitcom, a story centering on a modern Hong Kong family and their friends, is slated to air its 995th and final episode on April 1, 2016. The old and new cast members were welled with mixed feelings while shooting the final scene, which is a double wedding banquet for the characters Tracy (series regular Angel Chiang 蔣家旻), Tung-ho (guest star Leo Lee 李豪), Lok-yi (series regular Katy Kung 龔嘉欣), and Anson (series regular Owen Cheung 張振朗). When the director yelled the last cut, the cast sang the sitcom’s theme song “Embrace Love” <擁抱愛> together while taking a group photo. Angel Chiang, who has been part of the Ma family for four years, described her feelings as “complicated” when she was asked about how she felt while shooting the wedding scene. From being a university graduate to a newlywed bride, Angel said the cast has literally watched her grow throughout the show. She said she would keep in touch with the cast and plans to treat them to a meal once the project is over. Lead actor Lau Dan (劉丹) said his character, Ma Fu, has lived a full life in Come Home Love—not only does he get to witness his granddaughter’s marriage, he also gets to be part of the early years of his great-granddaughter’s life. Everything has truly come full circle for Ma Fu. While shooting the wedding scene, Lau Dan thought about his own real-life granddaughter “Little Sticky Rice.” He expressed that he will work hard to stay healthy so he can live to see the day of his granddaughter’s marriage. 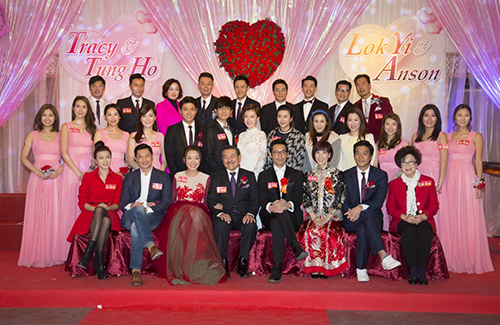 Louis Cheung and Priscilla Wong return for the final episode. “Ma Ka-ho”, Joey Law’s infant daughter in the series, is portrayed by Tsui Wing’s daughter Tsui Sam-yee. Come Home Love will air its last episode on April Fool’s Day 2016. A new sitcom starring Teresa Mo (毛舜筠) and Wayne Lai (黎耀祥), temporarily titled Seated at 8 <八時入席>, will take its place. Correction: Katy Kung was in the first series as Kenny’s sister. What about Alex? Did she come back to film the finale? 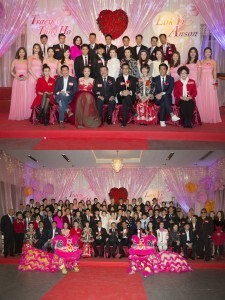 @krys327 Doubt so since the article didn’t mention her (or Joe Ma’s love interest) and she wasn’t in the photos above. Being my fav couple in the show, it is disappointing that they end up this way. @krys327 Nope…Queenie Chu said she wasn’t invited back to film the finale, which is odd given how much audiences loved her pairing with Lai Lok Yi as well as their storyline together. I know the 2 of them already kind of filmed the ‘ending’ to their storyline awhile back ago, but still – if they brought everyone else back, why not her? I wonder if there is something amiss in terms of Queenie’s relationship with TVB…. Interestingly enough, the ending reminds me of Kindred Spirit’s ending back in 1999 (which also ran for 4 years and also featured a wedding at the end with a huge cast reunion) – difference being of course that TVB totally butchered Come Home Love by deliberately changing the cast and story. In any case, will miss the Ma family and the chemistry the cast had. With all that said, I am actually looking forward to Seated at 8, since I like Wayne, Power, and Teresa and would like to see them collaborate again. Oh, and Anthony Wong participating in the sitcom in a cameo role (already announced last week) will definitely be an added bonus, even if he will only be in a few episodes.